* Updates original edition after three decades. * Interacts throughout with 17 traditionalist authors. * The view between extremes. “A tour de force . . . The book to deal with now” (Louis McBride, Baker Book House Church Connection). JOHN STOTT, London, England, U.K.: Tentatively holds to the view set forth in this book. Click here to read reviews from the world’s press. To view, click here . Reviews of books written in response to The Fire That Consumes . . .
WATCH a three-hour seminar by Edward on this topic, as recorded at Christian Gospel Temple in Cross Plains, Tennessee in August 2008 : Click here. LEARN from these cross-current presentations by Prof. Jonn McKinley (for eternal torment) and by Edward Fudge (for conditional immortality), at Biola University in Los Angeles in May 2011 Click here. ENJOY an interview with Edward on this topic in Modern Reformation magazine here. 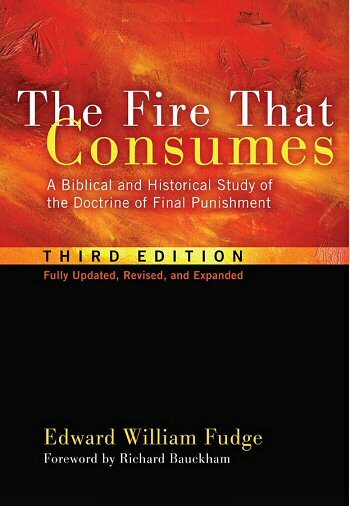 UNDERSTAND the influence of this book in stimulating a rethinking of the nature of hell by evangelicals around the world. In an article published in Vox Evangelica 24 (1994), p. 63-76, British scholar Alan M. Linfield summarizes the controversy and provides international perspective here. DELIGHT in a multimedia presentation on this subject from New Zealand (including reviews of this book) here.